In project management world, there are 10 knowledge areas. 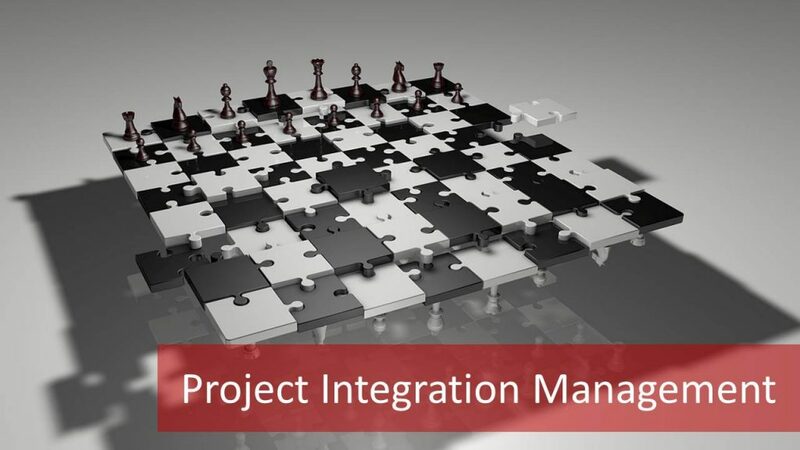 Project Integration Management is one of the biggest project management knowledge areas. There are 5 process groups and phases in a project. 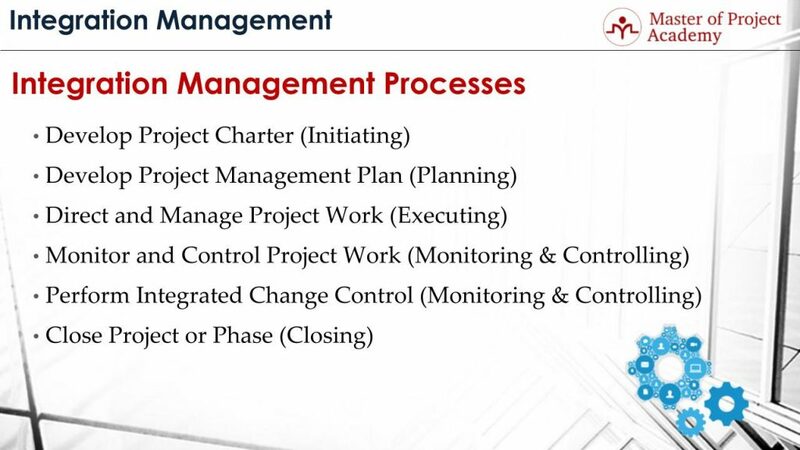 There are lots of processes and activities that need to be managed and coordinated during a project. And this is done mainly by project integration management. Project integration management purposes to direct and guide the project as a cohesive whole to produce meaningful outputs and meet the project objectives as stated in the PMP training. In this article, we will go over the overview of project integration management. We will describe what project integration management aims and who does what during project integration management briefly. More information about Project Integration Management can be found in CAPM certification training in which you can enroll and get certified at your own pace. What is the Definition of Project Integration Management? Project integration management ensures the management and coordination of all activities in a project. In other words, project integration management helps in putting all pieces of a project together into a cohesive whole. Several activities, processes, and people work in the project and this needs a proper planning to coordinate all these parts of a project. 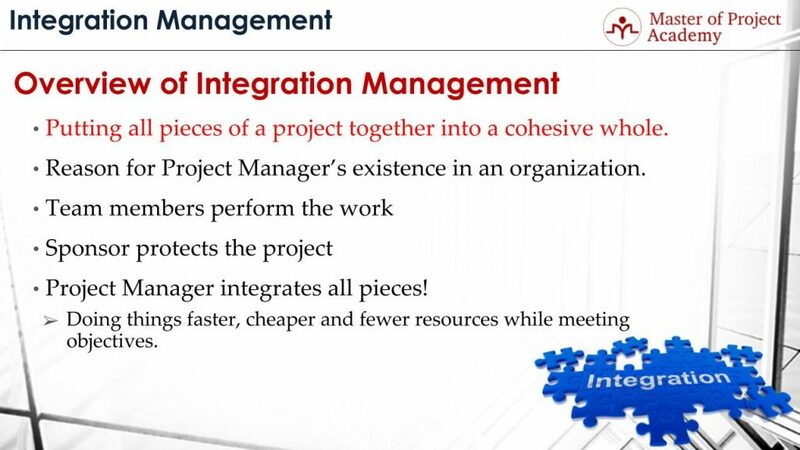 Actually, project integration management is the reason for Project Manager’s existence in an organization. Because the role of the project manager is to manage and coordinate the project activities in a project which is the same purpose of project integration management as well. 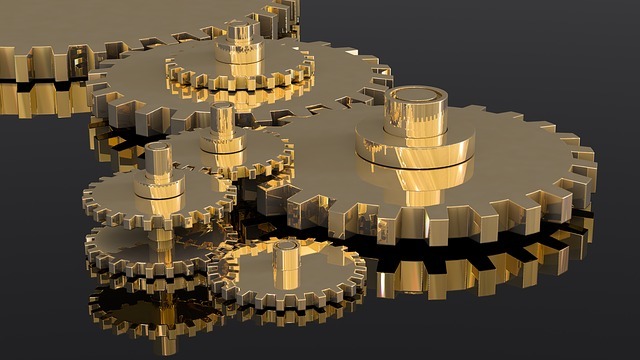 What are the 6 Project Integration Management Processes? There are 6 processes of the project integration management knowledge area. The project integration management knowledge area is the only knowledge area that has processes in each 5 process groups. Develop Project Charter Process: This process aims to produce the project charter. The project charter is like identity card of the project in the organization. It includes high-level information about the project and regarding information is gathered with the help of developing project charter process. Project Selection Methods: There can be several possible projects that can be initiated in a company. However, capital or investment budget is determined for a period of time and based on this restrictions, companies try to select best projects that will produce more profitable and advantageous results. Project selection models help at this step. Project are evaluated mainly based on their financial aspects and optimum projects are selected for initiation. Similarly, Economic Models for Project Selection also help to evaluate a different project and select the best options respectively. Develop Project Management Plan Process: This process belongs to planning process group and aims to finalize project planning and project management plans. Direct and Manage Project Work Process: This process aims to perform the activities that will produce the deliverables of the project. Monitor and Control Project Work Process: This process checks whether the project is progressed as planned. Perform Integrated Change Control Process: This process ensures the change management properly in a project. Changes are evaluated by change control board and accepted changes are implemented with the help of this project. Change Control Board (CCB): Change control board evaluates the change requests and impacts of these changes in a project. A change is approved or rejected based on the evaluation of change control board. Close Project or Phase Process: Once the project delivered all its deliverables and projective objectives are met, the project is closed officially with the help of Close Project or Phase Process. Who Does What During the Project Integration Management? During integration management, project team members perform the work. The project execution phase is where project team members perform their activities to produce project deliverables. And this belongs to project integration management. The sponsor financially supports the project. The sponsor also protects the project. There might be internal and external risks that might affect a project. Since the sponsor of the project is actually spokesperson of the project and initiator of the project, he must protect the project from impacts of any risks. Project Manager integrates all pieces! There are several activities, stakeholders, processes, project team members etc. in a project. The project manager is the ultimate responsible for the integration of these aspects to meet the project objectives. While doing this integration, project manager aims to do things faster, cheaper and with fewer resources while meeting the objectives. Planning is done mainly to walk through the project activities till the end and producing a project plan that will successfully deliver results with fewer resources and under a determined budget. Therefore, project manager ensures efficient and effective management of a project.